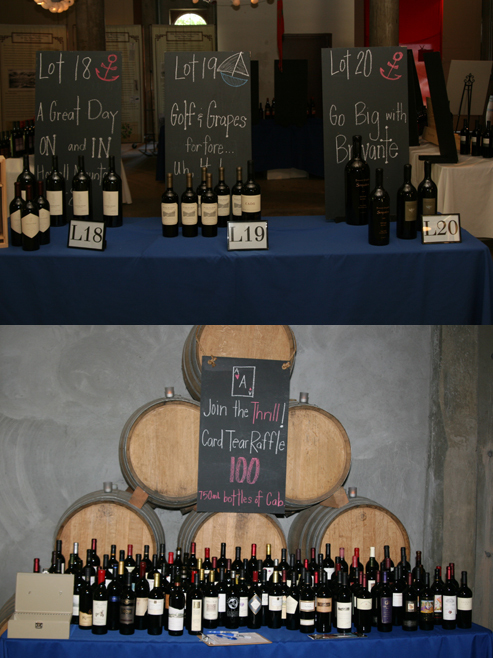 On Saturday June 15th the Howell Mountain Association held their 18th Annual Benefit tasting event at the beautiful Charles Krug winery in Saint Helena. This year the theme was nautical, based upon the upcoming America's Cup. 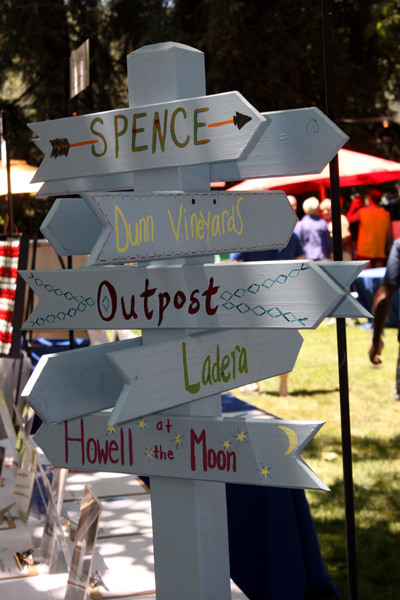 40 wineries were pouring their Howell Mountain sourced wines that were paired with clever nautical inspired small bites and lively blues music on a beautiful weather day. 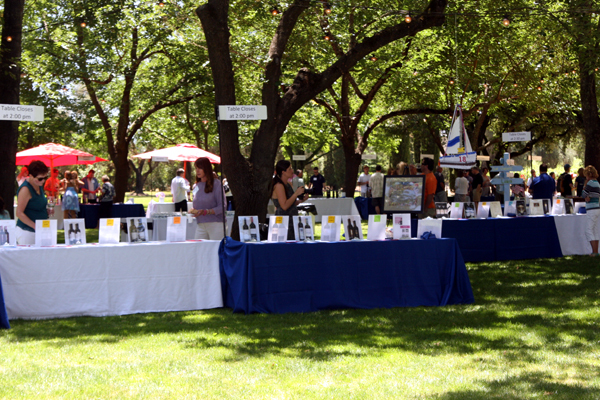 The beautiful and shaded grounds were adorned in regatta decorations with plenty of room to move about and sample the wines and food. 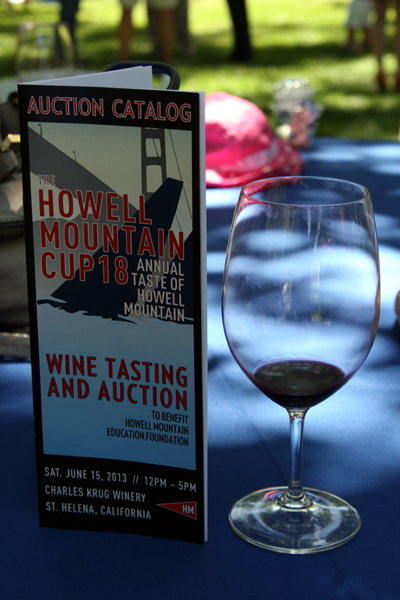 Now in its 18th year, this benefit on behalf of the Howell Mountain Education Foundation, raises much needed funds to benefit education, music, sports and special needs programs for local schools. 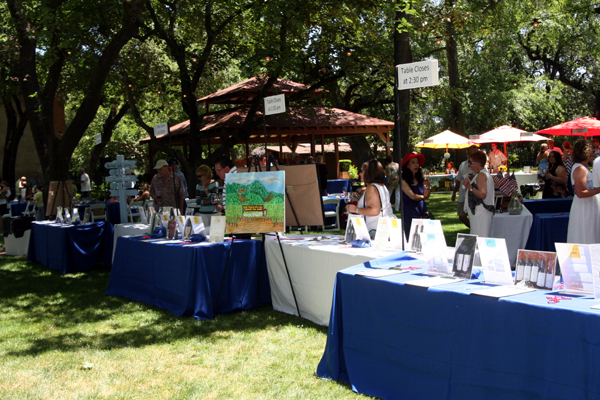 The wineries were organized alphabetically around the main courtyard which featured auction tables and plenty of seating in the middle. The weather was perfect, in the low 80's with just a slight breeze. 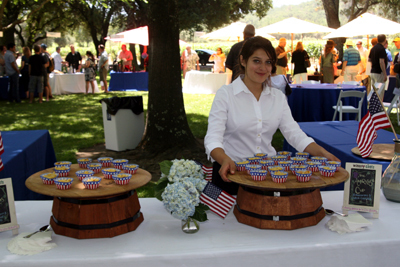 The volunteers, winery staff, caterers and organizers were spot on all day making this fantastic event very enjoyable for the patrons. Without further ado, let's get right to the food, music, and wine.. Ask any sommelier about pairing food with big Napa Cabs and you'll get nothing but groans and moans. The caterer for the event, Winery Chefs, was tasked with not only coming up with Cab friendly dishes but also with a nautical theme. Fortunately for all of us, they were more than up to the task. The dishes were clever and on theme but more importantly very tasty! Here's a quick run down on their dishes. 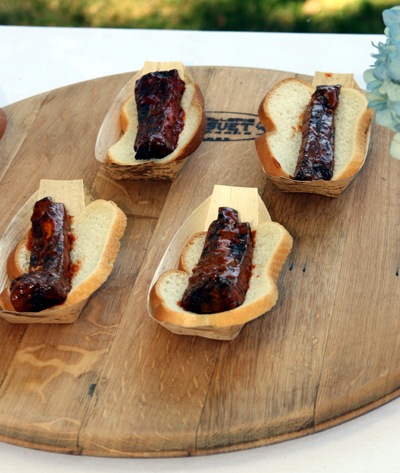 These were St. Louis style ribs served in bamboo boats on a slice of white bread made to resemble a wing-sail. The ribs were smoked low and slow then quick fried. The rub and sauce were robust but mildly spicy thus pairing nicely with the big Cabs being poured. The quick fry was a nice touch giving the outside a bit of firmness while keeping the insides tender and juicy. The white bread soaked up the extra sauce and juice and made sure we missed none of this great dish. The Americas Cup - Macaroni and Cheese “cupcake”. This was a delicious take on an old American favorite: Mac & Cheese! The dish was baked in fluted cupcake molds with Tillamook cheddar, goat, and parmesan cheese. This had a wonderful rich mouth feel and a subtle hint of smoke. A very rich and decadent take on the old favorite. Even before we tried one of these tasty sliders, we knew we were going to love them. That's because the folks serving them told us they were braised in Anchor Steam beer! Us born and bred San Franciscans love our Anchor Steam. 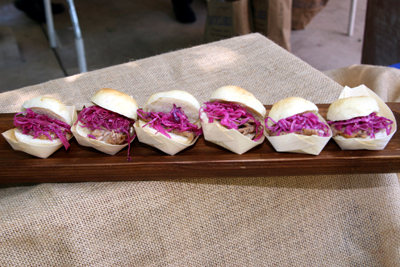 The slider consisted of beer braised beef brisket and served on Sciambra slider rolls with pickled red cabbage and whole grain mustard seeds. The tart cabbage and smooth tender brisket were perfect. Easily our favorite! Throughout the day, wonderful cookie samples were provided by Howell Mountain Cookie Company. We loved the chocolate chip and the "everything" which had oatmeal, raisins, and chocolate chips. Wonderful cookies! Upstairs at the Live Auction, Winery Chefs provided their final plate - Sea Biscuits. These were blue cheese and pecan Short Bread Cookies consisting of local blue cheese and pecan with a hint of cayenne pepper. These paired wonderfully with the big cabs but also worked nicely with the strawberries and sparkling white wine. A nice finale for the day. The folks at Winery Chefs were terrific all day from their pleasant servers to their brilliant chefs. We've always been big fans of their work but today was special. Bravo! This is our second wine event in as many months and we couldn't be happier that both featured The Hummingbirdz. 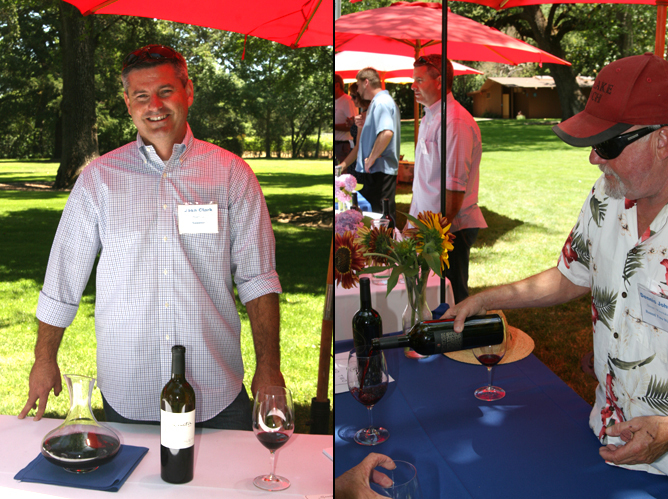 The members at Joseph Phelps loved these guys last month and it was no different here at the Howell Mountain Benefit. 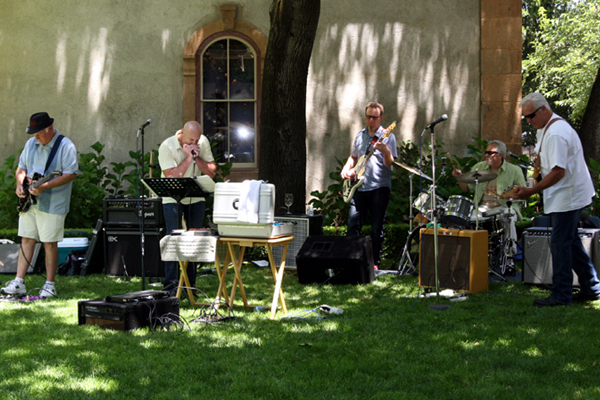 These guys bring up tempo high energy blues that is a great pair at wine events. Their great vocals and amazing solos had us bopping all day. Highlights included a new for them Albert King song Matchbox Blues plus a great take on Buddy Guy's Mary Had A Little Lamb as well as an end of the world rendition of Peter Gun that left more than a few jaws dropping. There's just something to the pairing of high-octane blues, big mountain Cabs, and BBQ that makes us happy. A great call booking this band!! The Howell Mountain AVA has many wineries but one thing in common. The high elevation and mixture of porous volcanic and red clay soils produce small concentrated grapes that produce big bold nuanced wines that are pure luxury to drink. Let's start our look at the wines with our hosts: Charles Krug. This big elegant Cab is full of dark berry, black cherry and subtle hints of oak. A true stunner. As our readers know, we have found some favorites from the mountain appellations and all really shined here. The opulent, elegant Cabs from O'Shaughnessy, Robert Craig, Red Cap, Arkenstone, and Bravante were easily the stars of the show. Robert Craig also had a sneak peek of their terrific Rosé as did Bravante. Both are true, dry and classic. The Robert Craig Zin (THE wine to pair with smoked baby back ribs) was also fantastic as was the 2007 Bravante Cab Franc. As always, we couldn't get enough of the O'Saughnessy 2009 Cab. Other old favorites included Cabs from CADE, SPENCE, Dunn, La Jota, Summit Lake and Notre Vin. Fittingly, we pulled a 2000 La Jota Cab out of our cellar after the tasting and enjoyed it with some tasty rib eye steaks. Look for our full review in our upcoming cellar selections article. We love Outpost wines and they were here in force with not only their Outpost label but also with two other offshoots. One that we found and loved at the spring tasting was the 2010 Cresta Velia Cab. A beautiful rich Cab with plenty of dark berry, plum, vanilla, and italian roast coffee notes with that perfect hint of subtle oak and spice. This is the side project of Outpost's assistant winemaker John Giannini. At $65 it's a steal for a wine of this caliber. The other related winery is Saunter Wines run by Josh Clark who runs the renown Clark Vineyard Management Company. One of his clients is of course Outpost and fittingly his tremendous Cab was made by Outpost winemaker Thomas Brown. The 2010 Eagle Summit Cab is a perfect example of Howell Mountain terroir with big mountain huckleberry, blackberry, and rich coffee notes. Sourced from the Eagle Summit vineyard at 2,100 feet this wine is a new favorite. Of course we would be remiss if we didn't mention the Outpost True Vineyard Cabernet which is simply life altering. This is among the best of the best in Napa Cabernet. The most recent vintage is sold out but there's always next year! 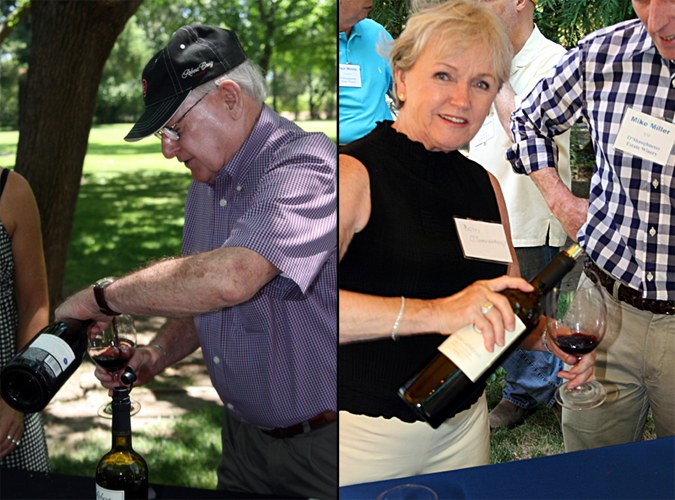 We've been huge fans of Winemaker Dennis Johns dating back to his days at St. Clement. We're happy to say he's back after a brief hiatus since selling his White Cottage label. The retro funky looking White Cottage jug Cabernet was among our favorites and we're happy to report it will be back in the future under Dennis's new label Round Two Wines. We've also heard that the Ezivese, a wonderful blend of Sangiovese and Zinfadel may be back as well. His 2010 Howell Mountain Cabernet was a huge favorite for us. Even better, the $60 price tag is a welcome fan friendly price for a wine this complex and well crafted. The Robert Foley Cabernet was huge, opulent, and spectacular. We also loved the Highlands Winery Cab. Lush, rich, and nuanced. This was a big hit. We would love Howell at the Moon even if their wines were not genius just for the name but genius they are. Beautiful examples of Mountain wine making at it's finest. Truly, each of these wineries make nothing but stunning wines. There was not a single bad wine at this event which truly shows the magic of this mountain. We highly encourage our readers to seek out these producers and visit this Napa mountain gem. 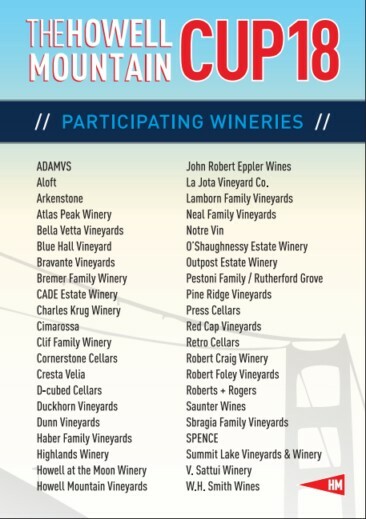 The list of all participating wineries is in the graphic below. All are worth seeking out! The tasting was tremendous but for more than a few the highlight was the spirited auction. Delicious bites from Winery Chefs were paired with sparkling wines (we loved the Frank Family offering) and more big cabs, zins, and merlots. The bidding was fierce and jovial and raised much needed funds for the local schools. Huge kudos need to go out to the very generous patrons. While like any auction there were winners and losers the big winners were the children. Thanks to all who participated. Last years event was the best we've been to (we've been coming for years) and we did not think it would be possible to top it (other than the 106 degree weather) but this was clearly the best yet!! Huge props to Sam Peters, his staff, the volunteers, the terrific folks at our host Charles Krug, Winery Chefs, and The Hummingbirdz for making this event so fun. We had a blast and can't wait for next year.